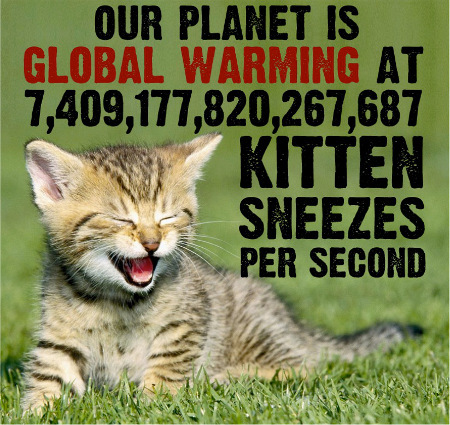 Nuttertelli & Kook's Nuccitelli & Cook's latest scare tactic employs quadrillions of kitten sneezes, instead of the repeatedly debunked analogy of global warming to Hiroshima bombs. My comment to his Guardian article today is posted below remains in eternal "moderation" at The "Guardian." "I (@dana1981) presented a poster (which can be viewed in the ePosters) outlining effective methods to communicate science via social media, based on our consensus paper communications success. Cook also discussed communicating the rapid continuation of global warming in terms people can visualize, like 4 Hiroshima atomic bomb detonations per second. For those who prefer a cuddlier comparison, Cook converted this to units of kitten sneezes – 7.4 quadrillion per second." When accounting for all heat accumulating in the climate system, global warming is proceeding at 7.4 quadrillion kitten sneezes per second. Image created by John Cook at Skeptical Science, photo courtesy of fanpop.com. Excellent. I suspect your comment will remain in limbo indefinitely. Too bad. Thanks Bart and thanks for all of your contributions as well! Indeed, the Guardian has still not published the comment.